Home / Games / Lara Croft: Relic Run: Spectacular running action! What’s more in Lara Croft: Relic Run MOD? I like this game. What about you? In my spare time, I often play games like Subway Surfer or Despicable Me. Endless games often bring exciting entertainment moments that do not require too many requests from players. 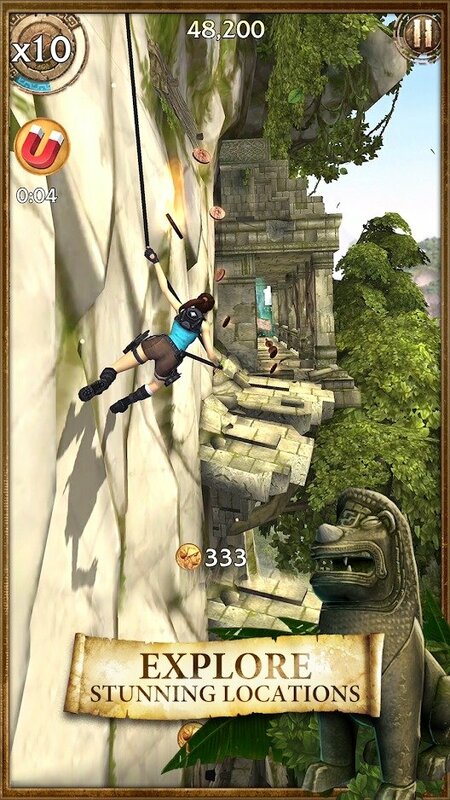 Lara Croft: Relic Run is a good running game inspired by the movie of the same name. The protagonist in the game is a pretty hot girl, designed like the character played by Angelina Jolie. 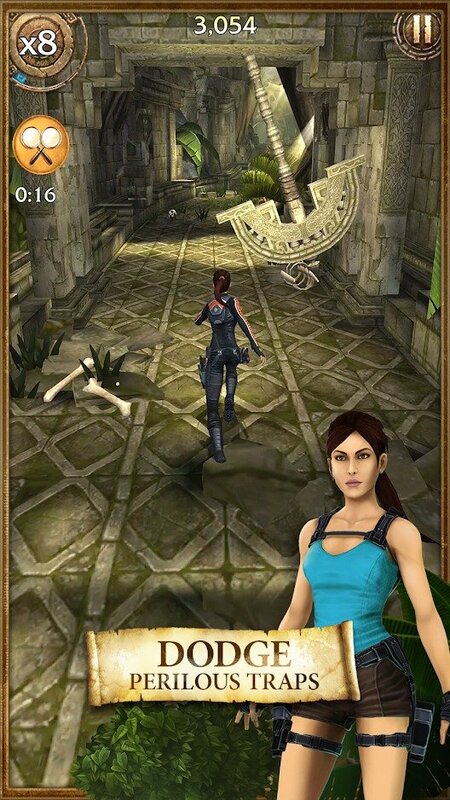 It is said that this is an upgraded version of Temple Run by two games with very similar gameplay and context. However, Lara Croft: Relic Run has more to do than just run and run. Lara Croft: Relic Run was developed by two well-known publishers, Square Enix and Crystal Dynamics. Games are available on both Google Play and the App Store, allowing players to download and install for free. Lara Croft is a girl doing archaeological work. She loves adventure, explores mysteries and finds ancient relics hidden in dangerous places. Her friend Carter Bell is missing on an expedition. He left the information about an ancient ruin. Following in Carter’s footsteps, Lara goes to a Jungle temple in Cambodia and then goes to Ruins desert. All relics are linked to Rahu, a wicked man who wants to destroy the world. Finally, Lara follows Carter to the Himalayas. Can you uncover the mysteries, stop Rahu to save the world? 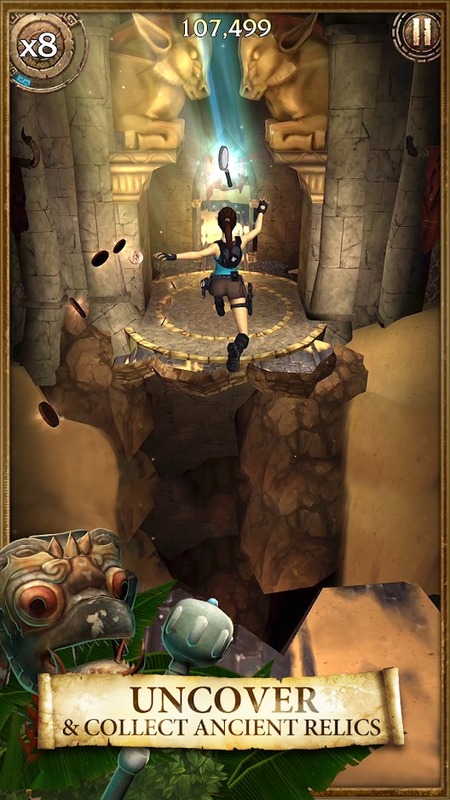 The gameplay of Lara Croft: Relic Run is very similar to Temple Run. Your character automatically runs forward, you need to swipe up, swipe down, swipe left or right corresponding to in-game actions. You can somersault, jump, surf or swing to avoid obstacles. The biggest difference compared to Temple Run is this time you will run without the giant monkey in your back. But not so the game reduces the dramatic because if you collide with the obstacles, you die and have to start over again. The diversity of the obstacles is incredible. Every time I play, I get a strange trap and sometimes, I see a trap that I have never seen before. 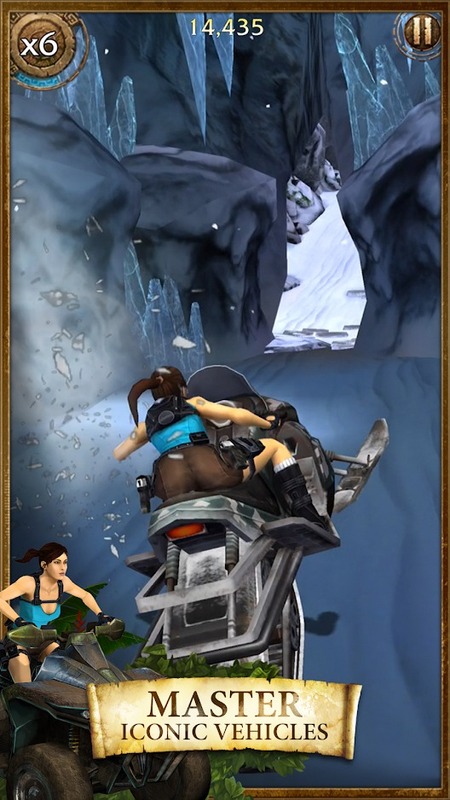 Not just running, Lara Croft: Relic Run requires players to collect ancient relics at the end. You have to find them in a single time. If you fail, you must start again from the starting line. In some stages, the enemy will appear in front of you. They want to prevent you from getting the monument, so use the things around the game designed to escape or defeat them. Games like Subway Surfer and Temple Run are great, but none of these games allow you to ride a motorcycle, use guns and confront a T-Rex dinosaur. Along the way, there are quite a lot of power-ups, which can help you over a period of time like Shield, Magnets, Weapons, etc. Besides, you can use numbers of coins you collect to upgrade your characters. Some health packs and weapons can easily be bought with coins. There is only one thing that is bought with diamonds called Resurrection Ankh, which is able to protect Lara from death. Sadly that Lara Croft: Relic Run does not have many characters, or rather just Lara alone. The game has some costume packages, you can buy it to change the image for Lara. 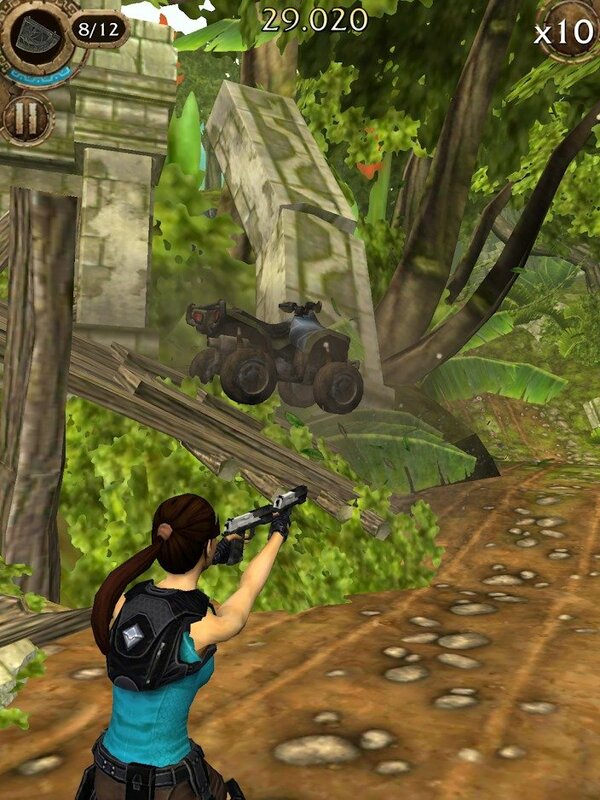 Lara Croft: Relic Run is like a simpler version of Tomb Raider. However, the game has realistic graphics, sharp image. Set in a jungle and ancient temples in the jungle, the game takes you on an unparalleled adventure. Many things are waiting for you. With a beautiful and hot appearance, Lara is the inspiration for many players (including myself). She is voiced by Abigail Stahlschmidt. The music of the game is also impressive when using Tomb Raider’s soundtracks. Lara Croft: Relic Run MOD (Unlimited Money) gives you a large amount of money to be able to buy the health package or outfit you want. The game does not require Root device prior to installation, but you have to uninstall the playstore version to make sure it works. Overall, Lara Croft: Relic Run is a fun endless mobile game and has a lot to discover. This game is fun, suitable for everyone. You can play anywhere, whenever you want. If you are ready, please select a suitable version via the links below the article to install the game for free. 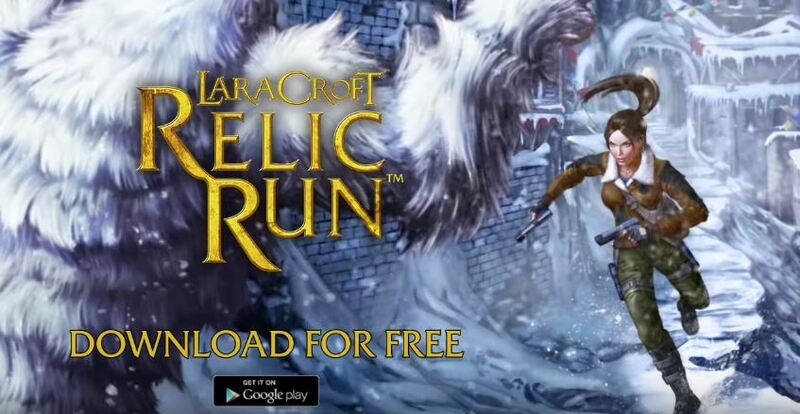 Lara Croft: Relic Run MOD APK is ready to download! 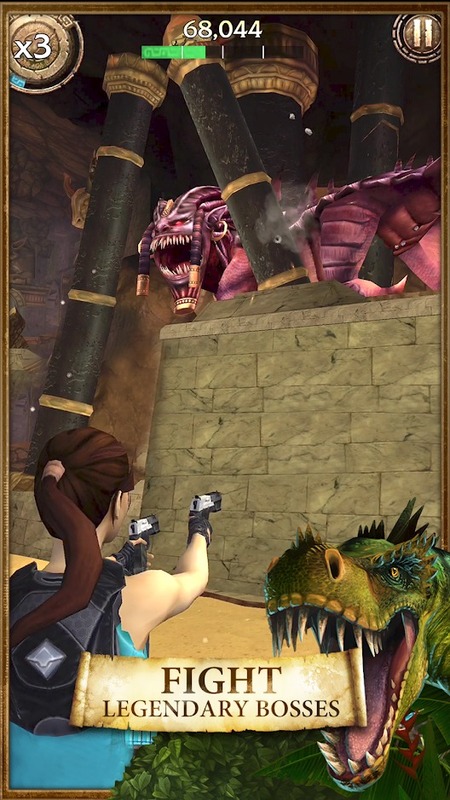 Depending on your needs, you can download Lara Croft: Relic Run MOD APK or Lara Croft: Relic Run Original APK. Or install from Google Play / App Store if you want.